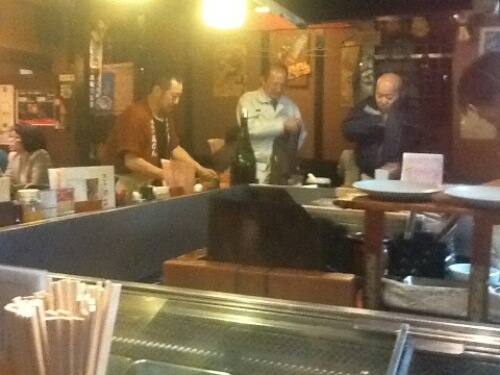 My best restaurant experiences in Japan have been when I have wandered away from the main roads, down side streets. Into residential neighbourhoods with small, Japanese houses. Restaurants are easy to spot, the traditional paper lantern hanging outside can be seen from far away. These small, local, often family-run restaurants will give you a great dining experience. The food is always good, sometimes the recipies have been in the family for generations. 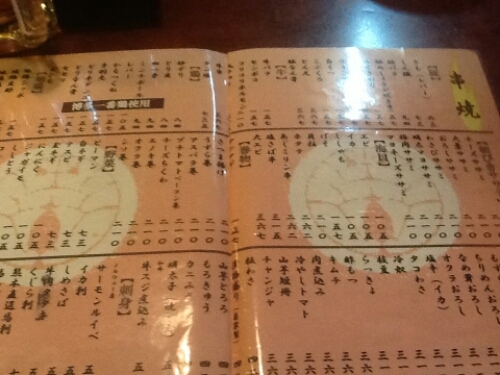 It is hard to order from this menu. 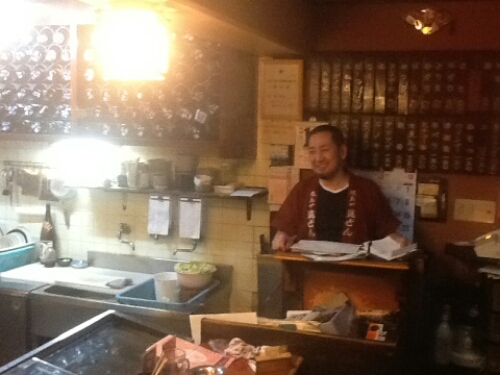 In Fukuoka, on Kyushu, the southern island of Japan, I found an amazing such yakitori restaurant. A small place, tucked behind a low door in a dark side street. I almost had to crouch to get in. Inside, the place was almost full. Two large groups of people, loud as usual, and a few people in smaller groups. I got a seat by the bar, sat down. 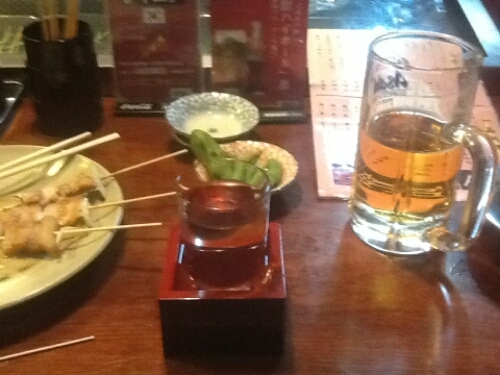 Ordered a beer and a sake before looking at the meny. It was impossible to read. Only Japanese. Beer, sake and delicious food. I could tell the restaurant was serving yakitori, or BBQ skewers. In front of me, in a cooler, they were all lined up. The chef managed to explain what some of them were. Pig, chicken, cow belly, pork, cow heart. That was all he managed to say in English. I simply ordered one of each, there were about ten or twelve in total. 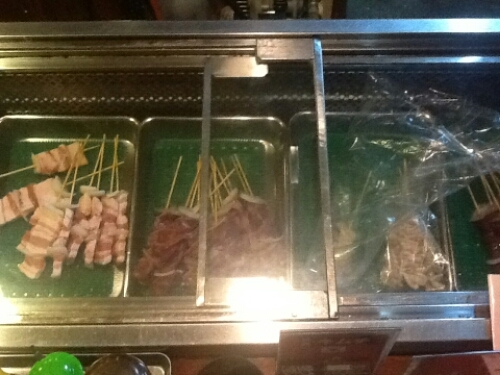 The different skewers were displayed in front of me. My drinks came, and not long after the food. It was delicious. 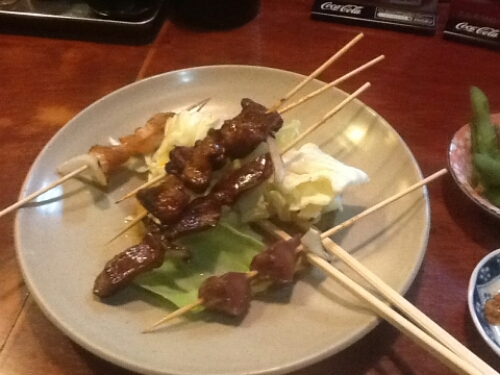 The chef made sure to only serve a few yakitori at a time so I always had hot food on my plate. Every time someone else ordered something as well, he made sure to give me a small piece of it. 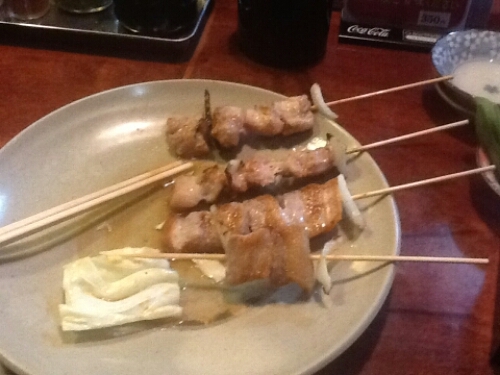 Apparently there was more on the meny than the yakitori skewers in front of me. The chef was a very nice man. I ended up spending three hours in the restaurant. Talking to the chef, some of the other guests. The food and sake kept coming, Japanese people love giving gifts to visitors. I was given so much, they refused to let me pay. I met an air traffic controller giving me his conspiracy theory about the missing Malaysian Airlines flight, a group of people working for Mitsubishi out for some drinks after work, two business men from Tokyo who happened to work not far away from where I would stay next week. The language barriers were huge, but a smile, a laugh and Google Translate can remedy that. It was almost midnight before I left. The night was amazing. I was so full, slightly drunk and with so many memories. It was a night to remember.